GETTING INTO YOUR JEEP SHOULDNT FEEL LIKE CLIMBING MOUNT EVEREST. 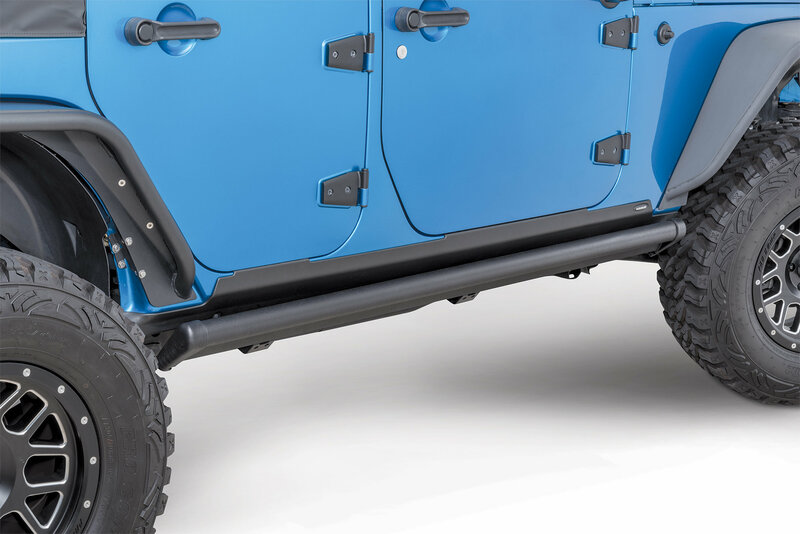 Thats why AMP Research invented POWERSTEP, the automatic, electric-powered running board that instantly extends when you open your door, and then hides itself safely out of sight when the doors close for improved ground clearance, aerodynamics and appearance. Its handsome design, all-weather performance and legendary reliability set the industry standard. Invented, engineered and built in America, AMP Research PowerStep have been tested and proven in long-term, real-world, driving conditions performing flawlessly in snow, ice, dust, mud and dirt. 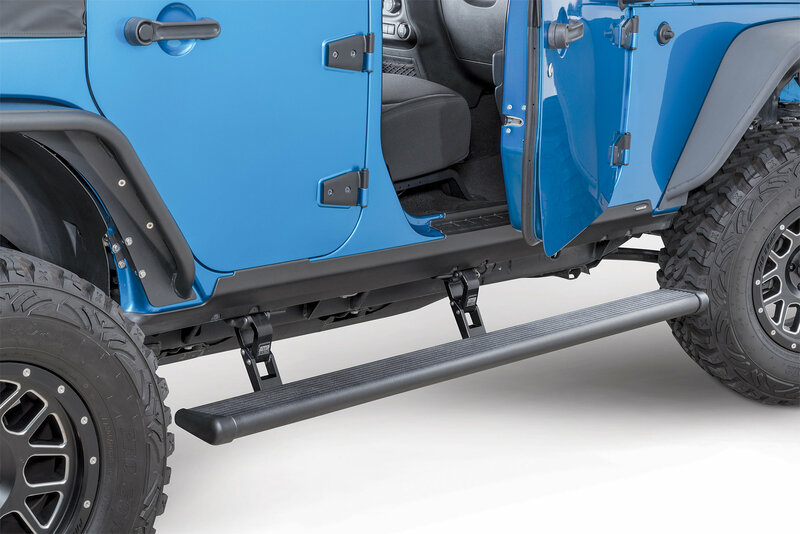 The lightweight, yet rock-solid running board and rugged die-cast linkage components are crafted in the USA of aircraft-quality aluminum, black-anodized and Teflon® coated for maximum corrosion protection. Precision, stainless-steel hinge points and bearings ensure trouble-free action. And the heavy-duty electric motor is designed and tested to provide reliable, maintenance-free operation for decades. Backed by an industry-leading 5-year/60,000-mile warranty. I bought my 12 JKU from a family friend and it had AMP Powerstep boards already installed by a shop that specialized in aftermarket customization. 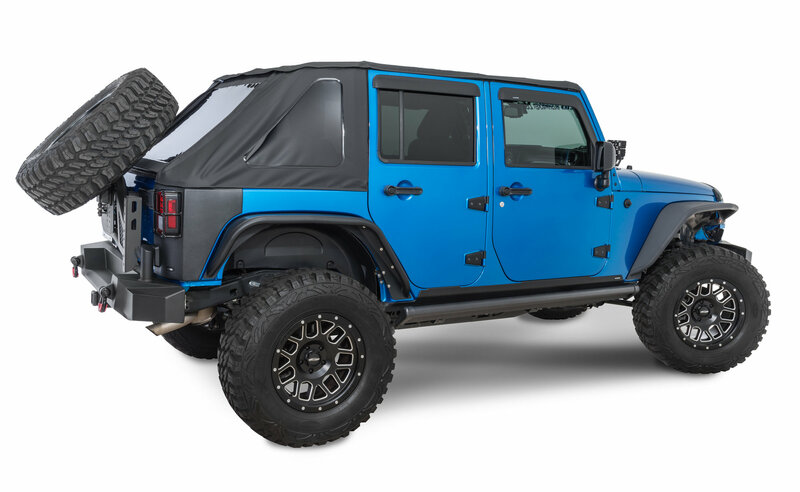 Due to the limited space between the frame and body of the Jeep, the motor is turned sideways and in my opinion the cause of the issues with this product. I have watched every YouTube video available, read the tech support on the AMP Research site, and I had poor service from the powersteps. Since I was not the original purchaser, the warranty was useless for me. I have bought 2 motors at a cost of $125 each and it would work for a while. I have followed the instructions for adjustment and again, it works fine for a while. I have the AMP Research Powersteps on my 13 Ford F-150 and they work every time. I got frustrated with the powersteps on the Jeep that I replaced them with a fixed step and threw the Powersteps for the Jeep in the trash. There are many posts on different Jeep related forums with people have the same sporadic service. I would not recommend anyone buy them for a Jeep, but certainly for the F-150 as the motor direct drives the mechanism and didn't have to be turned sideways. The tech support has always been nice on the phone, but they run you around a good bit before they break the news that no warranty exist since you are not the original purchaser. Easy to install and works great..
Are the Powerboards including the new style controller that accommodates the Powerboard Override switch for Jeeps yet? Hello, per the manufacturer this feature is not available on Wrangler PowerSteps. It is only available for PowerStep applications that utilize the OBDII, the Wranglers are all hardwired. Thank you for your question. Will these work with the doors off? If so, how do they actuate? The PowerSteps will not actuate automatically with the doors off. They will either stay in the stowed position, or you can manually lower them with your foot. Please see the install instructions for a more detailed explanation.